FriLight Targa Cap 8991 LED or Halogen Light. O-ring seals and frosted plastic lens with IP64 rating protect from dust and splashing water. White or Chrome fixture color options. Warm White, Cool White, Blue & Red LED choices. IP64, water resistant rating provides entry of dust and splashing water into light fixture, making this light an excellent choice for any boat location. G4-pin style bulb. 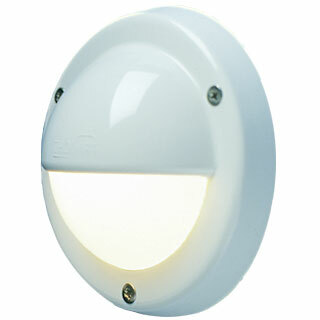 Choose from 12VDC Halogen light or energy efficient, 12 SMD LED bulb. This LED is able to function on an input of 10-30 volts DC. 160 Lumen Warm White, 190 Lumen Cool White, Blue, Red, and 3-Way Dimmable LEDs available. Halogen bulb contains Xenon gas for increased bulb longevity.